Photo courtesy of Jessica Williams. Who is this Al Dente guy anyway? I always wondered about that. And Sophia Loren for dessert. Al Dente is Auntie Pasta’s dentist. There a picture of a sea monster at the bottom of their banner. You don’t even think to call me Godfather. Instead, you come into my house and ask me to cook people. The interchange of letter ‘l’ and ‘r’ will always characterized Engrish from Japan and China. It seems like they did it on purpose and love it. The finger food really tastes like finger! Try it with some lice! Try the “Don” special. Or else. They’ll make you an offal you can’t refuse. I want my Italian with super mushrooms, please. Our pasta is always flesh because it’s served worm. Nope. I only eat flesh vegetalian food. Too greasy. Do you have anything else? German? looks a bit tough. English? Really pallid color, look like it’s got too much moisture. Greek? I’d rather not be picking hair out of my teeth all day. Well, I guess French would be alright, but I hear Californian cuisine is very healthy. I’ll have a Pizza with the workers, thank you. Fine, as long as the flesh is fresh flesh. @jjhitt. It is the Rock Ness Monster. I’ve been told English is one of the most difficult languages to learn but…..cmon! 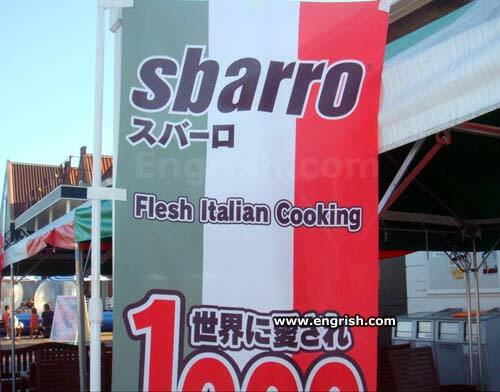 Nothhing better than flesh pasta!